Cat lovers from all over attended the first annual There's No Place Like Home Kitty Event on Saturday, Sept. 27 and had a great time! Michele and Gracie (shown to the right) were the gracious hostesses of the event. 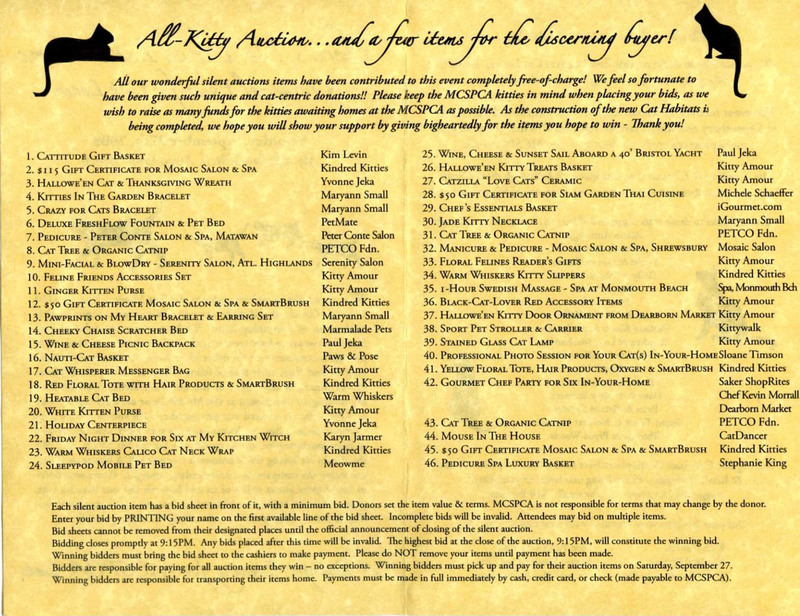 They put together the entire event, from the venue, to the auction items, to the party tent, to even the tiniest details to result in an event that was a lot of fun and also a great fundraiser where all proceeds go to help kitties at the MCSPCA and for kitty-oriented renovation details like Kitty Cubbies that have their own air flow to the trees that will be put in each gazebo for kitties to climb on. 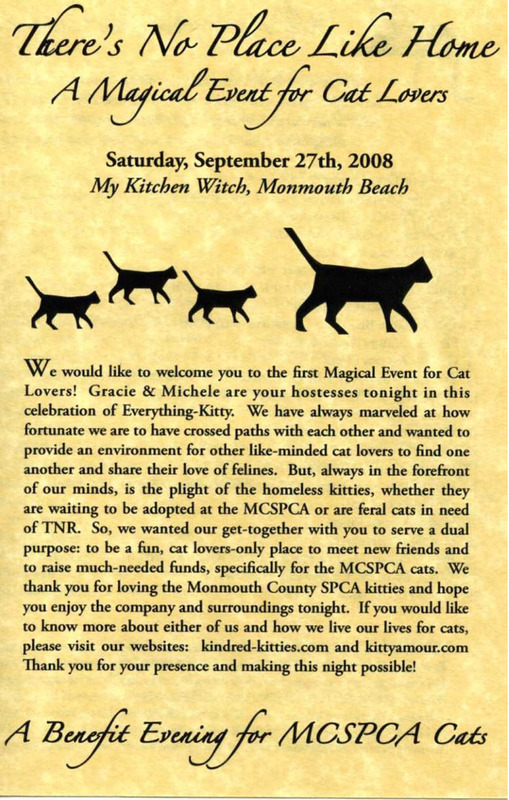 The event was held at My Kitchen Witch in Monmouth Beach. Karyn Jarmer, the "Good Witch" chef at My Kitchen Witch, put together a fabulous meal including her delicious cupcakes and her generous support meant even more proceeds could go to the needy kitties. Thank you Kayrn (shown to the left with Bill, our Emcee of the evening, thank you Bill for a great job!). We also thank Paul David Partywares in Shrewsbury for once again supporting the MCSPCA with a great tent and supplies for the event. 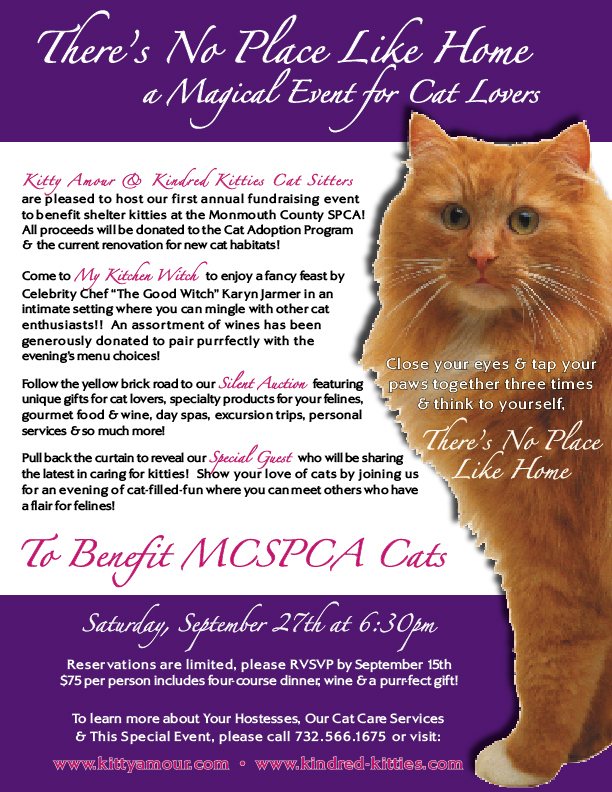 Thank you Paul David for once again making a MCSPCA event special. Drs. 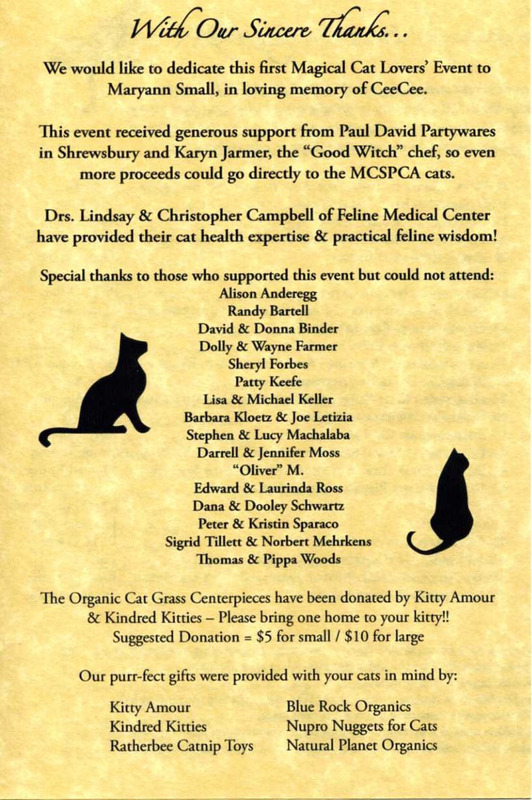 Lindsay and Christopher Campbell of the Feline Medical Center provided their cat health expertise and practical feline wisdom to the attendees. Thank you Doctors! The event was dedicated to Maryann Small in loving memory of her kitty CeeCee who unexpectedly went to the Rainbow Bridge this year. Maryann has been a long-time MCSPCA volunteer. She designs almost all of our graphic designs for events, invitations and more. She designed our logo and the Homeward Bound Capital Campaign logo, she takes photos at the Pet Walk and has volunteered on the Pet Walk committee for many years. And, she is a member of our Board of Trustees. Her years of service mean a lot to us at the MCSPCA and most all of to the animals. Thank you so much Maryann! Please right-click this image and "Open in a New Tab" to view full size. first-ever Cat Lovers Only Event!!! We hope to see you there! !